No one likes to lose his freedom and regular jobs do take a big slice of one’s life. Thus, the trend of work-from-home is increasing day by day and so the demands of people to earn extra online income. But before you sacrifice your full-time job to indulge into work-from home opportunities, you must do a thorough research about the prospects and reliability of such opportunities. It is important to identify common work from home scams, so you don’t end up wasting your precious time on unpaid efforts. Here is a list of some work from home scams that you might find very alluring and easy way to earn extra money. But no matter how much they attract you, don’t ever fall for these. 1. Envelope Stuffing: Believe it or not, this scam has been around for more than 80 years now. Think this way, if you’re an employer, why would you pay a dollar or two just to stuff envelopes with some illogical papers. In fact, even a well-established mailing company outsources this task for not more than a few pennies. Just try to think realistic. That’s it! 2. Chain Letters/Pyramid Scams: This is not a very commonly found online work from home scam, as it is illegal. These are a type of pyramid scheme spread to emails, as well as post. You receive a letter that asks you to send a small amount of money to all the people listed in it. You’re asked to put your name on the list and send out copies of the letter to as many people as possible. In return, you’re guaranteed to be a millionaire in a short space of time. 4. Typing at Home: This is one of the most common scams. Millions of people fall for them every year. You pay to get typing work, which turns out to be some creaky copies of advertisement you saw on the website. And you are asked to type them out, create multiple copies and sell them to others. Online industry is full of such advertisements. 5. 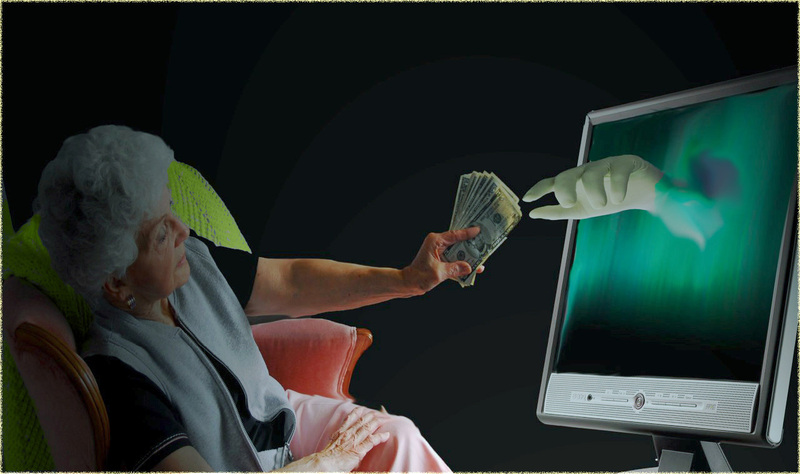 View Advertisement and Earn Money: Well, this is another very common scam that people fall for. Companies ask you to view advertisements of other businesses, and guarantee handsome payment for each view. But there are various terms that are not disclosed at the time of hiring. These include, the duration to view ads, number of ads to view daily, and many more like these. In short, you never get even a penny for your time and efforts you put on this task. 6. Refund-Recovery Business: In this work from home scam, the scammers provide you training and software to track shipments of popular shipment companies such as FedEx and UPS. The task is to assist the customers in obtaining refunds. However, the shipping companies have already mentioned a lot of times that all these refund-recovery schemes are simply work from home scams. Why would they let their private information out to unknown people? 7. Pay To Get Hired – Have you seen the advertisement claiming to provide you a list of top 100 fortune companies, hiring workers to work from home? This offer claims to provide you with a list of hot big companies that are now hiring people to work from home. The scam is that you pay a small amount of fee to get the list, but the fact is that it is simply outdated and useless. 8. Email Processing: Just like any other scam, you pay for an opportunity that never works! You are asked to pay a minimum of $50 as a fee to get training. Once you’re through the training process, you realize that it is nothing but some set of instructions to spam others. 9. Medical Billing: This might sound convincing and legitimate to many people, but it’s just another work from home scam you’ll find on the internet. Companies that ask you to pay a certain amount of upfront fee for training are nothing but scams. All you get is an outdated and incorrect list, which will serve you nothing. Moreover, hospitals hire only legitimate companies for this task and it is very difficult to find one. 10. At-Home Assembly Work: This is one of the most legitimate looking work from home scams. You pay to get work, get your first order, complete it and as soon as you inform the company about the completion of work, their reply would always be “doesn’t meet our specifications.” Bang on! You’re never paid for your efforts, let alone the refund! Take a note of these work from home scams and make sure you don’t prey to them. NO matter how bad you need a job, make sure you do all your research properly, before getting into one.